Several authors have asked me to teach them how I promoted my book L IS FOR LION. Here’s a quick list for you! Your book needs a party. Invite everyone you want to thank. Everyone who’s helped you along the way to this special day. Have books for sale, and have someone else handle the cash. I made paper roses out of manuscript pages. They were gorgeous, fun, keepsakes, gifts for the guests. At one point in the party everyone read some phrases out loud from their rose. It was fun to see who got what part of the book. I asked friends to help make this party happen. One friend donated the room. Another brought a case of prosecco. Another hosted a ritual, played DJ, etc… The publisher said “yes” when I asked for some money for food. I went to the best Italian deli and got broccoli-rabe, mozzarella, sopressata, olives… a feast.. I got blue glass champagne glasses for a buck a piece on-line at Dollar-Tree. Plan the party a couple of weeks after the publication date, to make sure you get the books on time, and all is set. Confer with the publisher about a safe date, so the books definitely will be in hand. Make sure your web designer understands SEO (Search Engine Optimization. So that when someone googles your subject area, your book has a chance of popping up at or near the top of the list. When you google Bronx Italian Books, my book pops up number 1) Keep your website on-point. If you’re a renaissance woman, keep the website focused about the book, at least for the first year or so…. Make a 3 minute video trailer of you talking about your book. Post to YouTube. Eblast the link. You can do this yourself. Keep it simple, focused, fun. There’s plenty of book trailers on YouTube to watch for examples. I had a friend hold my iPhone and I sat on a mailbox and talked. I edited in iMovie. You can watch it here. http://annielanzillotto.com/video-trailer/ Have fun doing this! 1. Make a spreadsheet of your contact list for book promo. Ask other authors to share contacts of reviewers, radio hosts, professors in your subject matter. Decide if you want to pay for a Kirkus review. It’s over $400. A year after my book came out, I am still giving out postcards and business cards everywhere I go. When I teach I give them to all the students. When I’m in a bookstore, I leave a stack, or post two (one front – one back) to the bulletin board. Order enough, and keep the copy on it timeless. On the front, the book cover. On the back, your website, a blurb about the book, etc… A USB code if you wish to connect to your website via scan. (My fave printshop is a Mom and Pop shop in Hoboken. You can order over the phone or email… Full House Printing. 201 798-7073 / larry@fullhouseprinting.com. Collaborate with your publisher to write a press release. You can use your jacket copy. 3. READER ACTION CARDS Give your friends, networks and audience a list of ways to get on board. Here’s a long list. Pick your top ten and make a hand-out for audiences. 2. ORDER through your local bookstore, public library, campus library. 3. VISIT (author website) read excerpts, view photos, video trailer. 5. WRITE a brief “customer review” on Amazon.com. Also post your review to goodreads.com, shelfari.com, librarything.com, barnesandnoble.com, and other literary social media lists. Reviewing helps readers find the book, and boosts in search engine algorithms. 8. E-MAIL blast your friends about the book. 9. WRITE a note about the book on FB, LINKED-IN, GOOGLE +, Twitter, INSTAGRAM, etc. 11. BLOG about the issues raised in the book. Start a blog. 12. TALK to your local librarian and recommend the book for their “one book one city” program. 13. RECOMMEND for your Book Club, or a friend’s book club. Start a book club. 15. RECOMMEND the book to someone who can review it for a newspaper, blog, magazine. 17. FORWARD this email to anyone you think might be interested in the book. If you know any newspaper editors, reporters, magazine editors, radio producers, TV show hosts or producers, columnists, bloggers, send them a copy of the book, or direct them to my website. 18. ASK me to mail you a stack of full-color postcards for you to place at your local theater, bookstore, campus center, coffee shop, library. 19. INVITE me to come read in your town at your local book store, library, classroom, or a home gathering. 20. Recommend your company buy this book in bulk for company fundraiser gift-bag. 21. HELP ME SELL THE RIGHTS If you have a connection to an actor, producer, director, who might be interested in making the movie, give them the book & my contact info. 23. Buy a couple of books and donate as a prize for your local public radio station for fundraising drive. 1. Make a Mailchimp or Constant Contact email blast list. Send Book Tour updates. 2. Make a FaceBook page for your book. 1. tablecloth to sell books on. (I made mine out of the last manuscript, filled with pen corrections.) You know, you show up for a reading, and there’s a folding table. Bring a cloth that looks good with the book. 2. Retractable Banner. This was the best thing I bought. It slings over the shoulder and pops open like 7 feet tall, easy as an umbrella. So, for conferences and book talks, I made a beautiful presentation of the book cover. Order from Full House Printing. 201 798-7073 / larry@fullhouseprinting.com. I love throwing Spaldeens at a chalked X on a brick wall. This is what I grew up doing. — So, my first solo show was built around that core image/action of chalking an X on the wall of the theater and throwing not one but a succession of fifty Spaldeens over and over at the X over the course of the 30 minutes. The show was called “Confessions of a Bronx Tomboy: My Throwing Arm This Useless Expertise” and premiered at Under One Roof Theater, and Manhattan Class Company Performance Mix in NYC. Directed by Victoria MacElwayne, with Live Sound Action by Eliza Ladd. I love big blocks of ice that are crystalline and weigh 300 pounds. I love the way the ice cracks, the way the crack moves through the ice when I stab it with a pick. I love the way light throbs through the ice. I love that I can spin ice and spin the light through the ice onto the audience. I love my naked skin on the ice, the way the ice melts and my skin freezes. I love the history of the men ancestors in my family who all carried ice around the Bronx to the people’s iceboxes. I love that I know the history of the Hudson River, that the river used to freeze up and be cut into chunks for people’s iceboxes. — I prayed at the graves of my ancestors. I went to all the graves of all the icemen in my family. I visited ice-houses. I bought ice tools. I hunted for the most crystalline pristine clean ice. I experimented with lights and with spinning the ice. I brought the ice on stage and figured out what to do when it melted. I learned how to carry ice. I pushed my body to the limit with lifting and breaking ice. I created the character ICEWOMAN. To date, I think of this as my signature role, signature prop. I am so connected to block ice. I love sitting on the blue corner mailbox and hanging out. I love banging the heels of my feet against the mailbox. I love that the mailbox was the site of New York City storytelling. That’s where we hung out as kids. I love the echo of my voice between two giant mailboxes when they are side by side. —- I chose the corner of Prince and Elizabeth Street where there’s a great mailbox, for me to sit on and regale my audience with stories, and then “host” the mailbox by having audience and passers-by get up there and tell their New York stories. The first half of the solo show was in a theater, in Dixon Place, and act two was on the corner at the mailbox, on the mailbox. 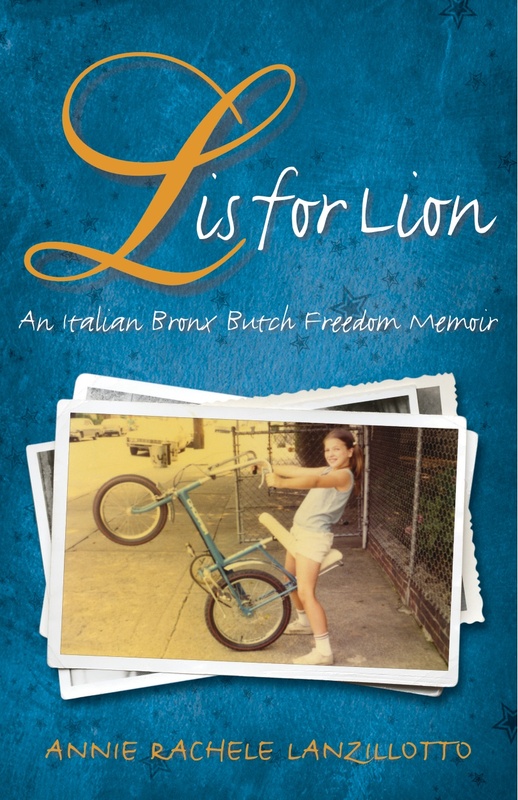 “L Is For Lion” is the achingly true story of a Bronx tomboy whose 1960s girlhood was marked by her WWII veteran father’s lullabies laced with dissociative visions of trench warfare. At four years old, Annie Lanzillotto hid silver teaspoons behind the heatpipes to tap calls for help when the fighting broke out between her parents. At eighteen, on the edge of freedom, her studies at Brown University were halted by the growth of a massive tumor inside her chest. Lanzillotto walked out of Sloan-Kettering just as A.I.D.S. was named, and made a wild truth-seeking ride out of survival, going into the fray of gay clubs and cross-dressing on the streets of Egypt. This poignant and authentic story could only happen in New York, with this quintessential New Yorker as narrator and guide, with poetic insights from underneath the dining room table, to the stoop, sidewalk, street and out into the world of Italian American characters and their stories about war, immigration, gay sub-culture, cancer, mental illness, gender dynamics, drug addiction, domestic violence, the childhood wonder of Spaldeens, crescendoing in a reluctant return home to the timeless wisdom of her peasant grandmother Rosa Petruzzelli who shows her the sweetest essence of soul. 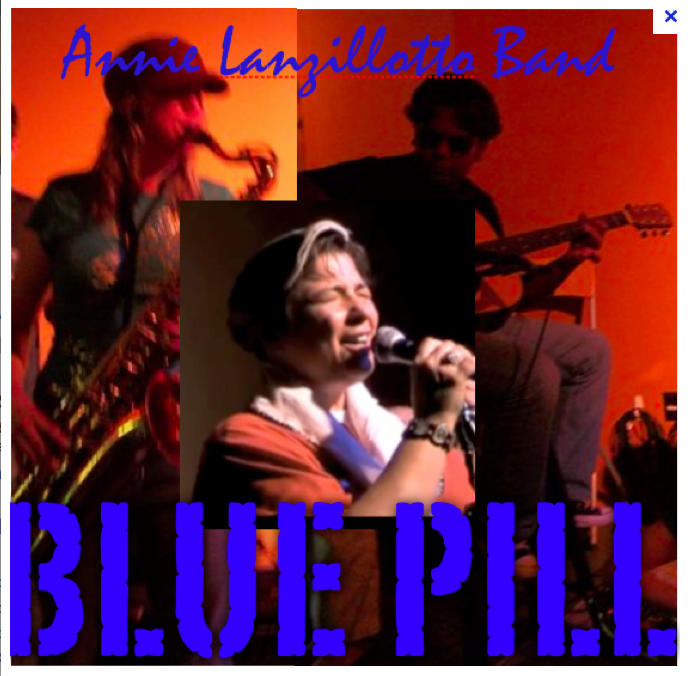 An album of Lanzillotto’s solo poetry with a bonus track of her “Mr. 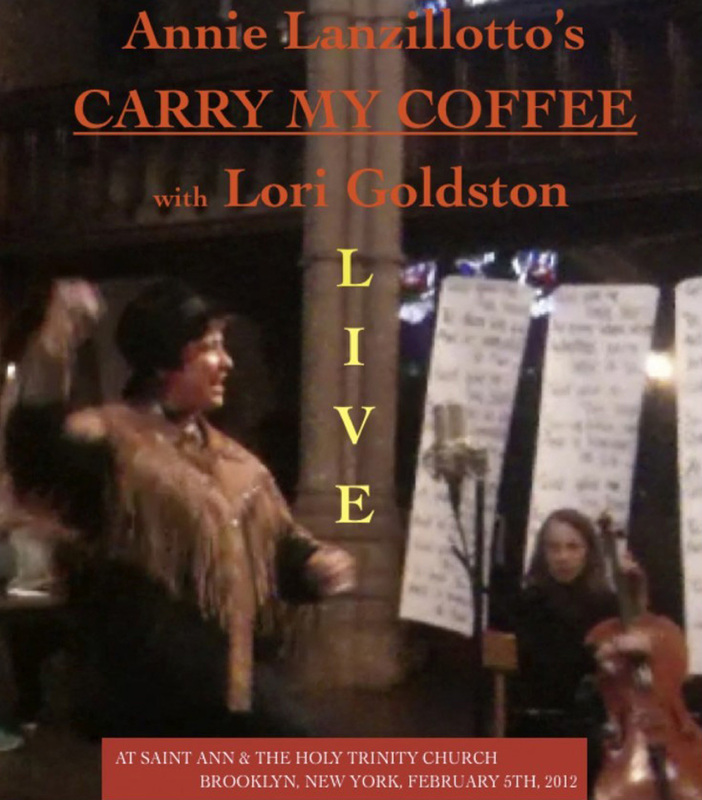 Butterfly” song live at Small’s Jazz, featuring Rose Imperato on sax, Lori Goldston on cello, and Sylvie Degiez on keys. Write both a script and a score for a short solo-performance. The distinction I’m making is that a script in this case looks like a monologue on the page. You can add your ideas for stage action or direction if you want. A score is a sequence of images, action, sound, text. 1. Zebra Diva enters stage naked in full body zebra paint dragging a wheelchair that she is handcuffed to. 3. Zebra Diva smashes wheel chair against upstage wall. 4. Zebra Diva whirls wheel chair overhead rodeo style. 5. Music fades as Zebra Diva sits in chair. Here’s a section from a score from my solo show “How To Wake Up a Marine In a Foxhole” that premiered at The Kitchen, in NYC, “Solo Voices” series in 1998. Spin the block ice in white side light so that light flashes into audience. Hugs the ice until it is still. Take ice-pick from holster and stab the ice. When I was in college, I climbed a pyramid at Giza. At the top of the pyramid, scratched onto the stone were names and initials from over the course of the eras. I remember seeing graffiti carved by Napoleon’s soldiers. Through all time motifs and messages repeated: “I was here”, praise songs, and stories. This stuck with me my whole life. Years later I began to write on oversize paper and I began to write on stage. I wanted to bring the act of writing out of the shadows of being a private act, and into the public sphere. So I rolled oversize rolls of paper across the stage. I got down on the floor and crawled around, and wrote as fast as I can. Then I got up, full of graphite, and performed recitations of the fresh text. Often the text started out by reflecting the moment, and then the writing always went deep, wherever it had to go. What’s a GENUINE RISK for you, on stage? What’s a GENUINE RISK for you, in life? What GENUINE RISK have you witnessed other artists do onstage?